“It is the dawn of a new era” at the Oaks Academy. July 7th was move-in day for the new Oaks Academy Middle School at East 1301 E. 16th Street. A small army of workers from Fed Ex, Cathedral, & Oaks Alumni, friends and families generously spent their day moving three semi-truck loads of furnishings. These sopping wet workers labored in the rain to get the job done. They were awesome…we were so glad to be there to record the event. 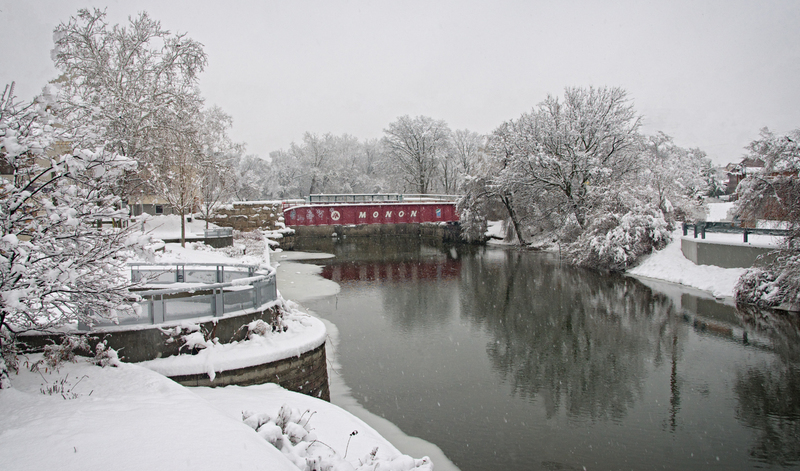 A Winter Storm has turned Broad Ripple, in north Indianapolis, into a Winter Wonderland. 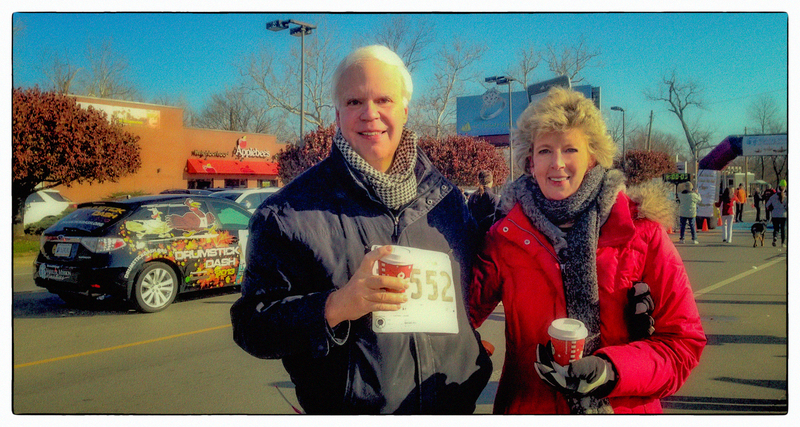 My grandson and I had a great photo walk enjoying the scenes and how the snow sculpted the landscape. 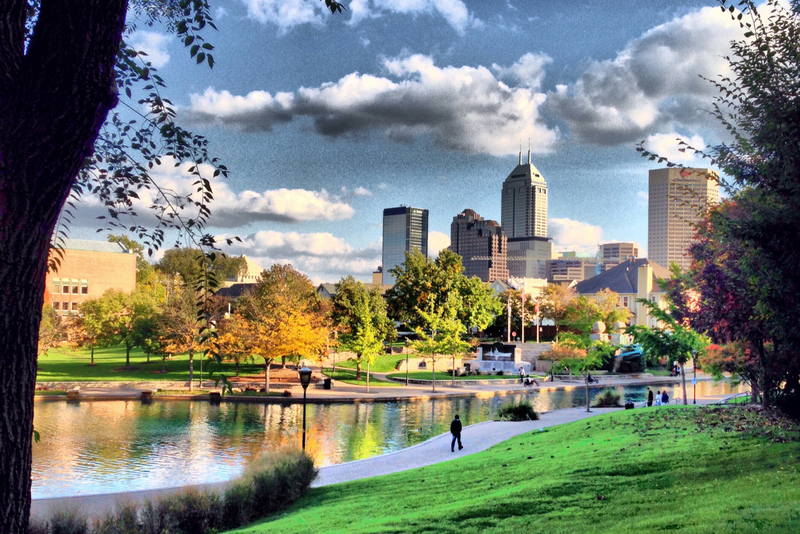 It’s Friday evening and Gerry and I were enjoying a bike ride in downtown Indy….what a beautiful evening. We are actually on a mission to find a good skyline view to use as a background to photograph a group of ten attorneys next week. I took this on my iphone and cooked it with “Dynamic Light” app on my phone. ps. Too bad the attorneys weren’t here this evening! Sometimes you discover an image buried deep within the raw data of a digital file. I discovered one the other day. I was covering an event and as I passed the bar I saw a scene that tickled my interest. I fired off a few exposure. It was extremely dark and very little detail appear on the back of my camera. It was the next day as I was downloading that job that I came upon an image that was so dark it was barely recognizable. I clicked on the file (I wouldn’t called it an image, yet) hit the “D” (Develop) key in Lightroom™ and moved the exposure slider to the right. Suddenly, magically, it came to life. I can well remember those days in the darkroom watching an image appear through the liquid in the developer tray. It was magic then, in the digital darkroom it is still magic. Enjoy the image “Men at the Bar”. We had just purchased a 14 – 24 2.8f Nikkor for our full frame digital Nikon D3, and had been waiting for a clear day with pretty skies and some snow. Fortunately, it came on a weekend, Saturday, February 16th. We were wanting to photograph some Indianapolis downtown scenes. As it turned out we spent our time around the Indiana State House and the Indianapolis Circle. Kathy concentrated on the Circle, shooting her Nikon D300 with an 18 – 200 3.5f Nikkor. What a fantastic walk-about lens. She bagged herself a image using a very evocative portion of the Indianapolis Circle to frame the the Indiana State House dome. Also, note the beautifully displayed unfurled flag. She titled her image “Staying Vigilant”. Clearly an image full of symbolism. Kudos to Kathy. I found myself intrigued by the Indiana State House and how my new ultra-wide might handle it. 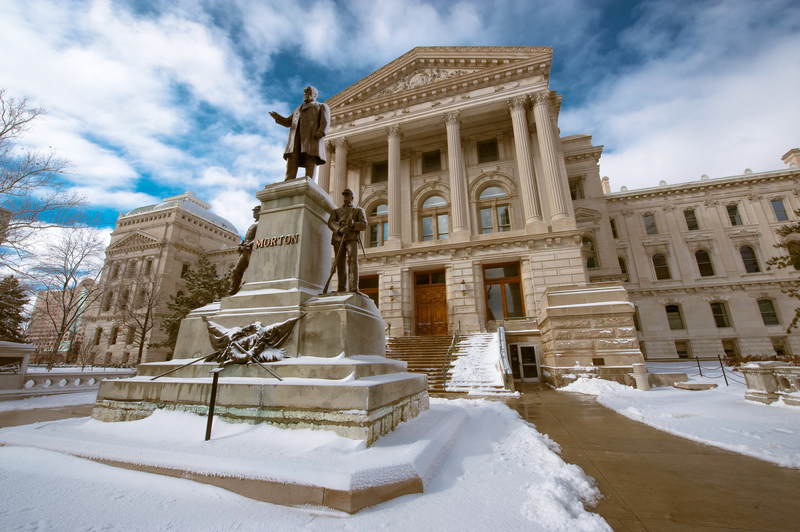 It worked perfectly, seeing the entire Indianapolis Statehouse rather then having to stitch panned images together. It did one of two things its does well, getting as much into the picture by having a wide angle of view. Nothing breathtaking, but the ultra-wide lens allowed me to be close enough to see the entire breadth of the State House without the buildings on each side of me blocking my view. I mention two things an ultra-wide lens does well. To me, the more exciting use of a lens like that is moving “ultra-close” to your point of interest and getting a wonderful, weird perspective. The key is being extremely close to your subject. In the case of the posted image “Man with a Purpose” I was three feet away from the base of the statue. Amazing! I think that perspective made possible with that lens creates a very dramatic exciting image. What do you think? Well, We spent two hour shooting, hit Giorgio’s on the Circle for a fantastic calzone, Starbuck’s for a cup of java and homeward bound. What a great morning of shooting. Now off to our digital darkroom. Be well, everyone.